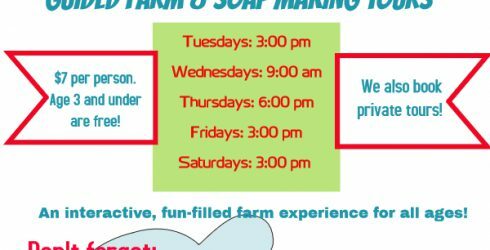 Starting August 2, 2016, we will be offering guided “barn to bath” farm & soap making tours! Individuals or small groups can enjoy guided tours of our farm and soap making workshop from the groovy farmer himself -Ryan! Find out how it all began. Get up-close and personal with our groovy goats and other animals. Learn about the soap making process and take home a soap sample. Allow approximately 45 – 60 minutes for tour. Drop by at your preferred time, or call (902-285-2265) or inquire on our website (groovygoat.ca) to book your tour in advance. If our tour schedule doesn’t work for you please inquire about booking a private tour (available on Tuesdays, Fridays and Saturdays). In September and October, tours are by appointment only. Don’t have time for a barn tour? Why not check out our petting farm located directly behind our soap shop anytime during business hours*? As of July 28, 2016, our petting farm entrance fee is $3 per person (children 3 and under are free!). Our returning visitors can ask about a season’s pass 😉 Take a stroll out to our goat enclosure to experience the sights and sounds (and smells!) of a farm firsthand. Wander into our newly constructed barn to visit our chickens, pigs and rabbits. There are also picnic tables and a children’s playground to enjoy. A perfect place for family fun, rain or shine! Don’t forget your camera as there are bound to be some great photo opportunities!